Beautifully decorated bright & sunny condo in the luxury condominium building of Washington Place. Open floor plan in Kitchen/Living Room offers perfect space for entertaining family & friends. Gourmet Kitchen offers all Energy Star Stainless Appliances, stunning granite countertops, 4 person breakfast bar, large pantry & plenty of cabinets for all your needs. Kitchen overlooking Living Room is nice sized & inviting for guests. Master is spacious w/ceiling fan, cable, recessed lighting & a wonderful walk-in closet with California hardware for organization. Large bathroom w/tub/shower combo and granite topped vanity & wood grain tile floor. An added bonus the stackable washer/dryer is neatly stored in closet in the bathroom. Unit has rich, tasteful dark bamboo flooring. 1 car assigned parking. Amenities include an exercise room & large storage unit on the first floor. 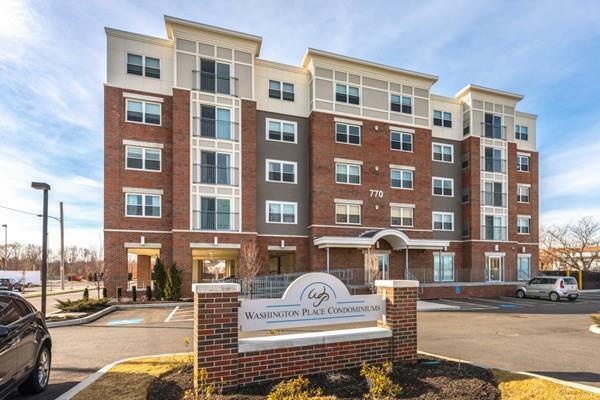 This condo is easy access to Route 1, Boston, Logan Airport, theater, shopping, restaurants & transportation. Elevator! !